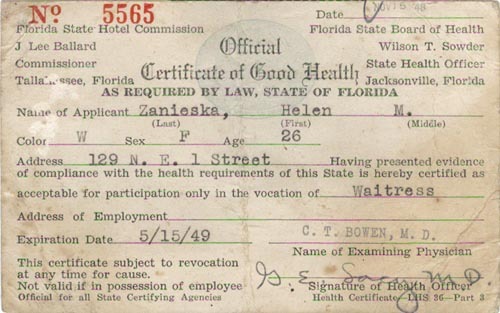 Florida State Hotel Commission, Florida State Board of Health, Official Certificate of Good Health: Helen M. Zanieksa, 129 N. E. 1 Street. Issued Nov. 16 '48. Are you looking for ZANIESKA ancestors? If so, we suggest posting a query to our Community Message Board to get assistance from other researchers.